If you may have noticed, I've recently opened my blog up to feature some other great bloggers to host some girly giveaways!! Today, I'm so excited to introduce you all to Natalia from Ma Nouvelle Mode! For all you who haven't taken French before, that means means My New Style. Natalia is a HOT MOMMA who is currently living in France with her husband (he plays professional basketball, how cool is that??) and her two little monsters aka kids :). Natalia may be a hot momma, but she uses her blog to talk about other things besides motherhood. I'm talking all things girly: fashion, makeup, crafts, etc. 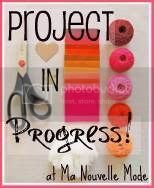 She even has her own cool linky party on her blog for projects in progress. Link up your projects and get advice from other great bloggers on how to finish it off! and this framed menu board! Today Natalia has something super awesome to give to one of my lucky readers..this totally fashionable necklace all the way from France! Do you see the cute little Eiffel Tower charm?? I love it!! I wish I could win. Boo. Too bad I can't. But you can!! SO. Here's how to enter! "I just entered @natalialsimmons giveaway at My Girlish Whims for a beautiful necklace http://bit.ly/hMwC4t"
Giveaway will be open until next Monday the 18th at 11:59 PM. Winner will be chosen with random.org and announced Tuesday! I am now following Ma Nouvelle Mode. Wow. How cute is she, huh? I follow My Girlish Whims! I like Ma Nouvelle Mode on facebook! Following Natalia Simmons ( Ma Nouvelle Mode ) on twitter as FabFlawed! Linked up at the Project in Progress link party! I'm a follower at Ma Nouvelle Mode. Natalia is such a sweet person! I "like" Ma Nouvelle Mode on FB. I like MNM on FB. I just linked up a dress refashion to Project in Progress. I just posted the giveaway to FB. I love that necklace. I'm a follower of Ma Nouvelle Mode. I'm also a new follower of yours. I also like Ma Nouvelle Mode on FB. Thanks for the chances to win. I'm a Ma Nouvell Mode follower! And I follow Ma Nouvelle Mode on Facebook! And I follow Ma Nouvelle Mode on Twitter! And finally I'm now a Girlish Whim follower! Whew!! Great giveaway! I would love to win can ya tell? What a great prize. I now follow Ma Nouvell Mode with Google Reader. Merci! I follow My Girlish Whims with Google Reader. Thanks for the chance to win! I am a brand new follower of Ma Nouvelle Mode and I am thrilled. Yep! I am a follower of yours too! I'm following following Ma Nouvelle Mode with Google Friend Connect (Deborah). I am a new follower of Ma Nouvelle Mode. I follow My Girlish Whims with GFC. I follow Ma Nouvelle Mode on Twitter @GoddessFoodie. I follow Ma Nouvelle Mode. I'm following My Girlish Whims (Deborah). I'm following Ma Nouvelle Mode on Facebook (Deborah Rosen). I'm following NataliaLSimmons on Twitter @AsTheNight. I'm a follower of Ma Nouvelle Mode! Following Ma Nouvelle Mode on Twitter. I am now a follower of Ma Nouvelle Mode. I am now a follower of My Girlish Whims. I liked Ma Nouvelle Mode on FB. I am a follower of ma nouvelle mode. Thanks for the chance to win this cute necklace. New follower for Ma Nouvelle Mode! I'm going to be scouring her archives because I get to visit France for the very first time this summer! (I'm moving to the UK for the summer for work!) I was a french minor in college and love everything about the country and the language! This necklace is just perfect! I am now a new follower of ma nouvelle mode! I am already an avid follower of My Girlish Whims! I follow you on GFC (Wendy). I am now following Ma Nouvelle Mode's blog!